Bob Roth sat down with Robin Roberts and George Stephanopoulos to discuss the benefits of Transcendental Meditation on Good Morning America Live in Times Square. His new book, Strength in Stillness: The Power of Transcendental Meditation, came out today, Feb 6, 2018. Along with many A-list celebrities who have learned TM from Bob Roth—Oprah Winfrey, David Letterman, Ellen Degeneres, Hugh Jackman, Russell Brand, Katy Perry, Michael J. Fox, Tom Hanks, Martin Scorsese, Stella McCartney, and many more—Robin and George are also students of his. Robin adds the notion of having no expectations, then brings up the issue of time, the amount of time needed to meditate for 20 minutes twice a day. Bobby then relates a true, funny story about that. There will be a book launch at Joe’s Pub at The Public in New York City tonight: Jerry Seinfeld, Hugh Jackman, and More To Celebrate The Release of Bob Roth’s STRENGTH IN STILLNESS: THE POWER OF TRANSCENDENTAL MEDITATION. The event will be webcast live Tuesday, Feb. 6 at 7:15 pm EST / 6:15pm CST / 4:15 pm PST on Events at TM.org and Facebook. They actually started 15 minutes later, so fast forward to watch it below. Hugh Jackman and Deborra-Lee Furness open the evening, then invite Bob Roth up to the stage. Bobby later invites Jerry Seinfeld to join him on stage around 40 minutes in. In the next half of the discussion Jerry talks about his work for the David Lynch Foundation. Bob starts to tell the story of how they asked Jerry to perform for a fundraiser. Jerry takes over and tells it like it was in his own hilarious way, when he found out he was going to be on the same stage that night with Beatles Paul and Ringo who were headlining the first Change Begins Within benefit concert at Radio City Music Hall. He also takes questions from the audience. Definitely one of the highlights of the evening! Proceeds from today’s event and sales of the book will go towards teaching women and children who are survivors of domestic violence and sexual assault to meditate through the Manhattan Family Justice Center. Visit the book’s website www.stillnessbook.com and scroll down to see Events & Tour Dates for book signings at locations around the country, some with other celebrities joining Bob Roth. Below that you will also find featured print and online news and stories, as well as a video library with event, television, radio, and podcast appearances. On Wed, Feb 7, Bob was interviewed by Rosanna Scotto and Lori Stokes on Good Day NY FOX 5 | WNYW. Rosanna posted a photo on Instagram of the 3 of them. The next book event followed that evening at the 92Y On Demand. It was moderated by Tony, Emmy and Golden Globe-winning actress and writer Mary-Louise Parker. Watch their wonderful conversation here. More news coverage continues to come out. Feb 10, 2018, The Guardian published this excellent article: Top US meditation teacher brings his message to stressed-out Britons. Guru Bob Roth, who numbers Katy Perry and Hugh Jackman among his fans, is to set up a TM project in London schools. Bob Roth is the most experienced and sought-after meditation teacher in America. Over the past forty-five years, Bob has taught Transcendental Meditation to thousands of people, from billionaire CEOs to combat-scarred veterans, to at-risk students in violence-filled schools, to leading figures in government, business, medicine, media, the arts, and more. In addition to serving as the CEO of the David Lynch Foundation he also directs the Center for Leadership Performance. In Strength in Stillness, Roth breaks down the science behind meditation in a new, accessible way. He highlights the three distinct types of meditation—focused attention, open monitoring, and self-transcending—and showcases the evidence that the third, Transcendental Meditation, is the most effective and efficient way to reduce stress, access inner power, and build resilience. Free of gimmicks, mystical verbiage, and over-inflated research studies, the book is a simple and straightforward guide to calming mind, body, and spirit. Watch this excellent book promo containing excerpts from various presentations, interviews, and famous meditators talking about what TM does for them, and others in need, posted on Bob Roth’s @meditationbob Twitter feed and on Amazon: How Transcendental Meditation Helps Relieve Stress and Drive Success. I just love this funny video clip of Russell Brand and Bob Roth promoting the British and American cover versions of Strength In Stillness. Bob says it’s available in 9 different languages. Watch what Russell has to say about it all. • Watch a replay of Bob Roth and David Lynch talk about Transcendental Meditation and the work of the David Lynch Foundation. The evening, hosted by Writers Bloc Presents, took place at the Wilshire Ebell Theatre in Los Angeles on Feb 12, 2018. • Watch Maria Shriver interview Bob Roth on her show Architects of Change. • Listen to Bob Roth on Marketplace with David Brancaccio. • Listen to 10% Happier with Dan Harris interview “Bob Roth, Meditation Teacher to the Stars,” Episode #122. Also on iTunes. Apple Podcasts: http://apple.co/1pHJh5a Spotify: http://spoti.fi/2tOEMcB Google Play Music: http://bit.ly/2mPRAiW. • Town Hall Seattle Feb 15, 2018: Bob Roth and David Lynch Strength in Stillness: The Power of Transcendental Meditation. • Enjoy TM News: Strength in Stillness: Bob Roth Talks about His New Book, the Rise of Meditation in Our Culture, and the Future of TM. Q&A with the longtime TM teacher and DLF CEO. • Bob spoke at The Free Library of Philadelphia on Feb 20, 2018. Watch the 51:35 replay on Livestream. • This ET clip, published Feb 22nd, is going viral: Why Celebs Are Obsessed With Transcendental Meditation | Entertainment Tonight. Here’s why so many stars are using this silent practice to really unplug. • Bob Roth in conversation with Daisy Lowe on Facebook, UK, Feb 27, 2018. Fast-forward about five and a half minutes to start the interview. • The Bookseller: Tyler, Lowe and McCartney turn out for Roth’s book launch, published February 27, 2018 by Heloise Wood. • Liz Connor of TV3Exposé in Ireland asks: Could Transcendental Meditation be the key to beating Britain’s stress epidemic? • Bob Roth promotes Strength In Stillness: The Power of Transcendental Meditation on Today Extra, Australia’s popular TV morning show. • Consciousness and Creativity with David Lynch and Bob Roth at Arts Centre Melbourne, Australia, March 10, 2018, on Facebook. • Consciousness and Creativity with David Lynch and Bob Roth at Art Gallery of New South Wales, Australia, March 10, 2018, on Facebook. • Hollywood’s guru on how to meditate like Oprah, March 14, 2018, stuff: well&good. • Ellen Welcomes Transcendental Meditation Expert Bob Roth, April 2, 2018. • Red Dirt Report: BOOK REVIEW: “Strength in Stillness” by Bob Roth​, April 17, 2018. Related: Watch an earlier lively interview with Bob Roth on BUILD. Find more articles and interviews with Bob Roth on TM and DLF on The Uncarved Blog. 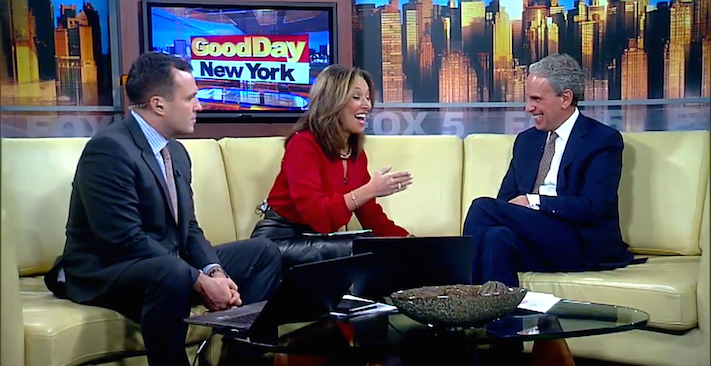 Bob Roth, executive director of the David Lynch Foundation, appeared on this week’s Fox 5 WNYW Good Day New York morning newscast* with Rosanna Scotto and Greg Kelly to talk about Transcendental Meditation. Rosanna’s friends were telling her about it, and she was interested in learning. So she invited the in-demand TM teacher to the show. Bob explained how easy and effortless it is to learn and practice TM, and how different it is from other more difficult approaches. He also described some of the many scientific published research studies showing improvements in health, education, and rehabilitation. He emphasized TM wasn’t just for the needy or wealthy segments of society. Everyone could benefit from it. People from every walk of life were practicing it — military personnel, Wall Street brokers, educators, physicians, housewives, students, anyone dealing with today’s stressful challenges. More than just relaxation, he said TM gives you more energy, focus and drive to get things done. Rosanna asked about the work of the Foundation and the upcoming concert. Bob described the various DLF projects helping different at-risk sectors of society, and announced the November 4th Change Begins Within Benefit Concert at Carnegie Hall. 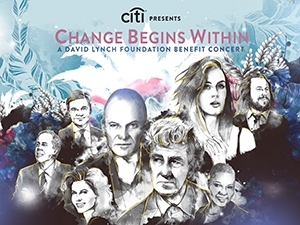 This event features performances by Katy Perry, Sting, Jerry Seinfeld, Jim James, Angelique Kidjo, and Sharon Isbin, with musical direction from Rob Mathes and hosted by David Lynch and George Stephanopoulos. Proceeds from the event will benefit the David Lynch Foundation’s Meditate New York initiative to provide Transcendental Meditation instruction at no cost to 10,000 at-risk New Yorkers, including underserved youth, veterans with post-traumatic stress, and women and children who are victims of domestic violence. *This morning news show originally aired on Tuesday, Oct. 13th, 2015. You can watch the 10-minute interview in a larger format from the Fox 5 archive HERE and at the TM Blog. Rosanna Scotto attended the DLF benefit concert and talked with Greg Kelly about it on Good Day New York. 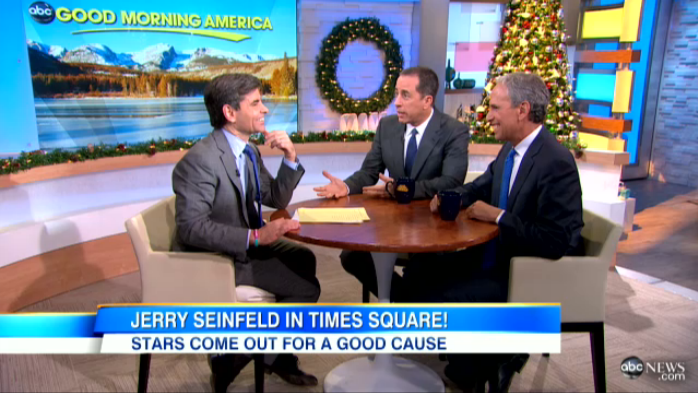 This morning on Good Morning America, George Stephanopoulos interviewed comedian Jerry Seinfeld and Bob Roth, executive director of the David Lynch Foundation, on the importance of Transcendental Meditation for PTSD. Jerry said he’s been practicing TM for 40 years now. Both Seinfeld and Roth gave clear explanations of what TM can do for you. Jerry added his trademark humor describing how stressed George’s work was having spent the morning with him on the set. George said he’s been practicing TM for two years and it’s made a big difference. While on the set Jerry helped chef Emeril bake Christmas cookies. Bob Roth discussed the successful application of TM for veterans and inner-city school students with PTSD. He mentioned a recent TM study published by the American Heart Association showing an almost 50% reduction in heart attacks, stroke and death in patients who regularly practiced Transcendental Meditation over a 5-year period. Roth also mentioned Admiral Schneider, President of Norwich University, the oldest military college in the country, using Transcendental Meditation to develop resiliency in their cadets, inoculating tomorrow’s warriors against stress. See President Schneider discuss the impact of the technique at a recent Iowa Veterans Summit on PTSD and Transcendental Meditation. Uploaded on Dec 13, 2012 by meditationchannel. Click to read a Transcript for Jerry Seinfeld on Importance of Meditation for PTSD. Tonight at the Lincoln Center an historic jazz concert was held as a Benefit Gala to fund such projects sponsored by the David Lynch Foundation. Visit www.changebeginswithin.org to see the line up of top jazz musicians. Mail Online gave a report from the Red Carpet with photos of celebrity guests and musicians: All jazzed up: Liv Tyler steals looks on the red carpet at star-studded music gala for the David Lynch Foundation. Recapo also gave a good synopsis GMA: Jerry Seinfeld, George Stephanopoulos Transcendental Meditation. You can see photos on the m&c website: 4th Annual David Lynch Foundation Gala Pictures. Read this excellent report in BULLETT by Stella Girkins: Celebrating Transcendental Meditation at the 2012 David Lynch Foundation Benefit Gala, which also includes a video from the David Lynch Foundation: Changing Lives With Meditation. See the DLF Gala Benefit Report. Related news: Soledad O’Brien interviews Russell Simmons and Bob Roth of the David Lynch Foundation on TM for Vets with PTS on CNN’s Starting Point and Study suggests meditation may help prevent PTSD—Boston Globe article by Bryan Bender. Elevated Existence: Jerry Seinfeld Talks About His 40 Years of Transcendental Meditation. See the video Highlights from Jazz at Lincoln Center Benefit for David Lynch Foundation. See the latest news on TM at Norwich University, May 10, 2016. Watch this Feb 6, 2018 show: @GMA’s @RobinRoberts & @GStephanopoulos interview @meditationbob on his new book #StrengthInStillness: The Power of #TranscendentalMeditation.